One of the biggest challenges when writing papers are to make sure that there is no copied content especially from the sources you have used. This means that you will have to rewrite the source in your own words so that the original message is relayed without copying the source word per word. You may use synonyms, which is part of the paraphrasing process, but it takes more than replacing words with their synonyms to get your point carried across. If you want to deliver the best paper, you will need to learn the paraphrasing process first. If you don’t have time to do it, it is always a good idea to hire an article rewriter or use rewriting services to handle it for you. Copy ideas instead of words. When you’re rewriting articles, the aim is not to copy words – the aim is to copy ideas. Instead of focusing on how the original writer composed their sentences or what words they used, focus instead on their ideas. Familiarise yourself with the meaning, and understand exactly what the writer is saying here. Rewrite paragraph by paragraph. A lot of people fall into the trap of rewriting sentence by sentence. But this is bad practice and will improve the likelihood of plagiarism. Instead, read chunks of text and rewrite them. When your mind has more words to process, it’s less likely to copy them word for word. Instead, it will be focused on extracting the ideas as opposed to the words. Add your own ideas. If while rewriting the article you experience a lightbulb moment whereby you think of something 100% fresh to the article, you should totally go ahead and add it. Don’t limit yourself by relying wholly on the original text. If you have something to add that will improve the text, don’t be afraid to add it. Adding more will also help to distinguish your article from the original. Whether we like it or not, article rewriting is just part and parcel of content writing in 2018, it’s not rewriting history. In a perfect world, perfect content writers would be able to come up with fabulous articles from scratch without relying on other content for inspiration. Unfortunately, we don’t live in a perfect world. Instead, we live in one where time is everything and rewriting content is essential if you want to keep up with your competitors. Another solution is to try professional rewriting service help. The problem with rewriting articles is that you have to make sure that yours isn’t too similar to the original text. If it is, you’re going to be guilty of plagiarism. One solution is to find LOTS of new information that wasn’t included in the original text. This will prove difficult, though, as most of the info will already have been included. It will also be exhausting and time-consuming to come up with lots of new information. The second – and easiest – a solution is to rewrite the article with a text rewriter in such a way that you’re paraphrasing without plagiarising. Paraphrasing means that you’re turning the whole article into your own words while retaining the core meaning. You aren’t copying and pasting, but are instead crafting a new piece in your own voice that was inspired by the original piece. When Do You Need Rewriting Articles? Citing sources. There is nothing wrong with citing sources but as much as possible, you shouldn’t copy entire texts by enclosing them in quotation marks because your essay won’t look impressive if it is peppered with quotes. Poor grammar. If the source that you are using isn’t written well, you can rewrite the source to make their meaning more understandable. Improve quality. The first draft of your paper is usually written in a free flowing manner but the succeeding drafts will most likely be rewritten in order to improve the content. Make paragraph shorter. Another way to rewrite content is when you need to shorten your paper or the original source. Rewriting cuts any useless statement so you will get the meat of the message instantly. Create new versions. Article rewrite means that you will be churning new versions of the original source so you can have several options to consider. Eliminate errors. The first draft may contain errors that you haven’t noticed but rewriting your paper can help eliminate this problem. There is simply no reason why you shouldn’t hire a professional rewriting service when it comes to paraphrasing content especially when you are aiming for quality output. One of the advantages, when you avail our services, is the assurance that you will be working with professional writers. We have the best team of writers and editors that can easily craft you an original article. In fact, we will adhere to your guidelines to make sure that your paraphrasing needs are properly met. If ever you need professional help in article paraphrasing, invest in quality services to ensure that you will receive an original and flawless paper. Save yourself the trouble and simply avail our online paraphrasing service online now! With our service, the article rewriter you will be working with will be someone who has a good grasp of the English language as well as rewriting rules so that you will get the best rewrite from us in no time. We guarantee that you will get the best results from us or you will get your money back. After all, your satisfaction is of the utmost importance to us. Get our professional help now if you want to know more “how to rewrite an article” secrets! 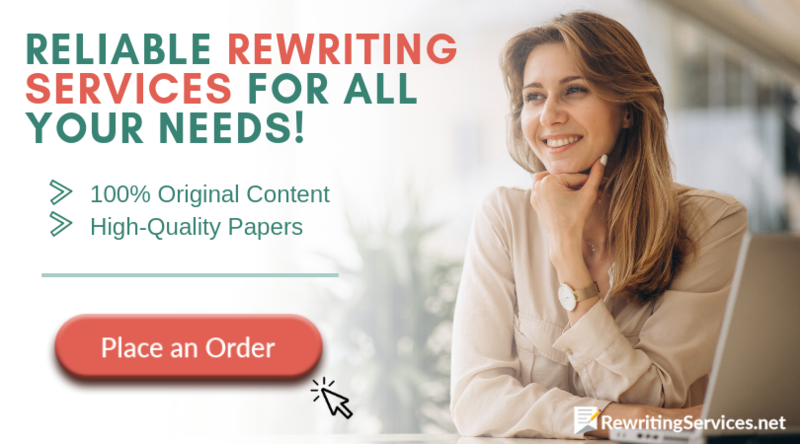 Be ready to receive 100% original and well-written paper! I am seeking for professional service and I see it at RewritingServices.net. You really have the skills and the expertise. You made my life easier and I no longer need to deal with stress. The paper I received from you is catchy and it is appealing. And more!!! We will cope with any custom request. Just fill in our simple order form or use our 24/7 live chat to proceed with your order right now.